If you’re a business owner, coach, consultant, freelancer, or content creator, it’s likely that at one point or another, you’ve fallen prey to one or two sneaky marketing beliefs. You know, one of those things that seems like a good idea at the time but leaves you feeling overwhelmed, frustrated and with no results. When it comes to creating a great marketing strategy, there’s one question that everyone tackles — whether they’re a newbie or an established, successful business owner. How do I consistently attract a steady stream of clients into my business WITHOUT breaking the bank? We all need to attract the right audience because having a steady stream of buyers is key to making a business run. You’ve probably gotten a TON of advice about the best ways to consistently attract new clients. You may have already tried a bunch of ways to bring that steady stream of clients to your virtual doors with varying amounts of success. You may notice that all the sales you bring in go right back out as you’re trying to attract your audience and grow, making you feel stuck. You may feel like there is some marketing secret that you’re missing because the “proven strategies” seem to flounder and flop when you try them in your business. You may feel overwhelmed by where to start after getting a lot of mixed messages from various “experts” around the web, which creates a lot of confusion about what you REALLY should do to get clients coming in your door. You may even feel like marketing isn’t in your skill set wheelhouse, so you’re not sure if you can even grow your business with online marketing strategies. Listen, busy entrepreneurs like you and I cannot afford to set aside weeks and weeks of time on busy work and not actually bring in clients and sales. That busywork is those sneaky marketing beliefs at play. If you’ve ever tried to launch a new marketing strategy before, you know that awful feeling of waiting for someone — anyone — to validate that your time, investment, and hard work will pay off. In my experience, there are three big beliefs that are to blame for poor marketing performance and lackluster sales. We’re going to tackle these beliefs today, and I’ll show you how to replace them with truly effective beliefs that will not only reward all your hard work but also have you hitting the refresh button on your browser (with a smile!) as you see the results come rolling in. What most entrepreneurs think of as “marketing” is really just a small piece of the full picture. Most view marketing as a Gary Vaynerchuk-type “big” marketing personality. You picture someone who’s out there all day, every day, in your face with hard-hitting zingers, creating content like a machine, and hardly ever “selling” in the traditional way — just delivering tons of engagement, entertainment, and some value. So then we think we’re doomed. The truth is you could go out tomorrow, and try to emulate exactly what Gary Vee does. You could live stream, tweet, speak, give interviews, share content across every social platform around, and basically create content from the moment you wake up until the moment your head hits the pillow at night. And it still wouldn’t work. When you see Gary Vee (and other big personalities) do these attention-grabbing marketing activities, it’s actually just a small part of their entire strategy. What you see is just a piece of an entire, well-integrated marketing funnel revenue engine behind the scenes. A truly effective marketing strategy involves 4 key phases — warm up, invite them in, set the stage, offer — all of which must create a conversation about a specific problem your perfect audience already has and really wants to solve. Fact is, you don’t have to be a bigger-than-life content machine to make this marketing strategy work either, but you DO need to have the 4 key phases nailed down so that every marketing thing you do leads your audience deeper into your marketing funnel engine. Specifically, your marketing funnel needs to include strategic content designed to set the stage perfectly for your paid offer. When done right, your marketing funnel will also include a list building piece, an email marketing strategy, a simple tech approach so everything runs 24/7 automatically, a focus on why you, why now, and why your offer is the one for them, special offers to drive decisions and so much more. When you get everything in place, you’ll have a strategic asset for your business to fuel your business growth, freeing you up to focus on the best ways to attract the right audience into your sales machine. It’s true that creating a marketing funnel does require a bit of investment, but it certainly doesn’t have to be big, complicated, or crazy expensive. From trying to find the best technology to figuring out how many emails you need to engage and convert your audience, a step-by-step blueprint can make a super complicated marketing funnel strategy doable for even the busiest entrepreneur. When you’re the business owner that possesses that marketing funnel blueprint, the overwhelm and complexity of creating a predictably profitable marketing funnel becomes a huge competitive advantage. YOU have the unique chance to be the FIRST in your space to effectively create a strategic experience for your audience. Some of my favorite marketing funnel systems are ClickFunnels, Kartra, LeadPages, Optimize Press, New Kajabi, and Thrive Architect. I highly encourage you to check them out, take them for a test drive, and see which one fits your business best. You’ll see that these options not only make it fast and easy to get a marketing funnel up and running, but many of them are super affordable as well. Yes, creating a marketing funnel does require effort, but when you do it right, you put that effort in once to get it up and running, and then you can use your marketing funnel for years to come. You just need to know that the effort you put into creating this marketing funnel will actually pay off. What you cannot do is afford to try and hack someone else’s funnel where you only get to see a small piece of their actual strategy. This will lead to you wasting time, energy, and money stuck in the “figuring it out” stage while you miss out on all the opportunities out there. Many business owners are frustrated. They’re overwhelmed by the number of marketing things they feel like they have to do all day every day. They spend a ton of time and money creating ads, videos, social media posts, podcasts, webinars and more that don’t work. The reason these don’t work is that they’re not part of a complete system. They’re just doing random acts of marketing that keep them super busy, stressed, and overwhelmed but don’t actually pay off with clients, sales, and a community of fans. The fastest growing, profitable business owners don’t have special skills. They aren’t the most amazing writers. They’re not the best-looking on-camera personalities. They don’t have a social media team posting 200+ updates every day. They’re not the biggest, loudest personalities. They don’t have the fanciest logos and websites. Want to know what they’re really exceptional at? Asking good questions. Listening to their audience. Crafting an experience to show their audience that they can help them. The truth is you have EVERYTHING you need to be great at marketing. Ears, eyeballs, the ability to ask questions, and a computer. You simply need to know what questions to ask and what to do with your audience’s answers. Then you can use those answers to craft a marketing funnel system that attracts, engages, and converts your audience into eager buyers. If you’re reading this right now, you’re in the perfect place to stop the marketing activity craziness and create a strategic marketing funnel before any of your competitors catch on. You’ll then have a profitable sales engine ready to work for years to come. Chances are that those competitors who you think are good at marketing (the old “marketing busy work” way) are actually frustrated because they’re working hard, and nothing is paying off. This means you can gain a huge competitive advantage by building a complete marketing funnel based on proven frameworks, techniques, and strategies that I’m about to share with you. Now that you know 3 Sneaky Marketing Beliefs You Need to Banish (and What to Do Instead), I’ve created a simple quiz to help you discover the exact right marketing funnel for your business. I’ll even give you the exact blueprint and video training to get started right now. 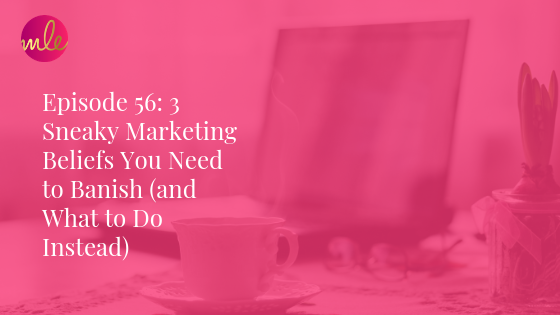 I don’t want you to get lost in a sea of marketing overwhelm. I’ll show you exactly how to avoid the traps that make marketing funnels flop and instead show you which marketing funnel is right for your business so that you can create a client generating engine that will fuel your business growth for years to come. I’ve been building marketing funnels for years now, and I’ve made a TON of expensive mistakes along the way. You don’t need to make those same mistakes! Instead, I’ve created a simple quiz to help you discover EXACTLY which marketing funnel is right for you. Click here to take the quiz now!